Our final port of call was Freeport, the largest city on Grand Bahama, the northernmost island in the chain. 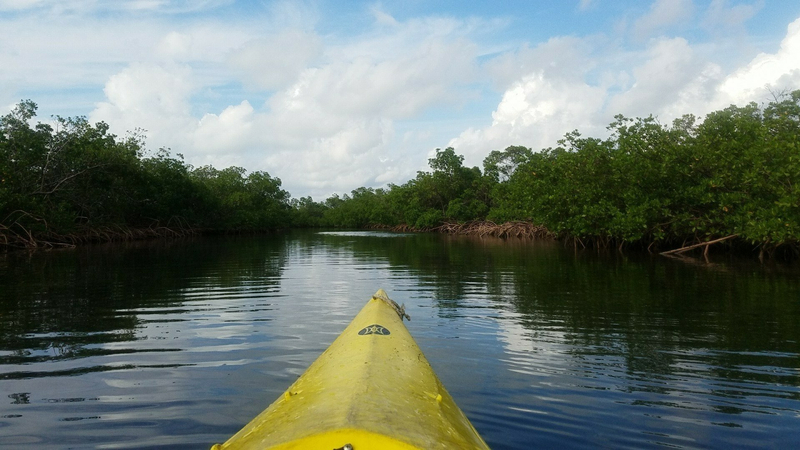 My excursion this time around was a kayaking trip through a mangrove swamp. Mangroves, which come in several varieties, thrive in tropical and subtropical coastal climates. Their vast networks of interlocking roots provide a sanctuary for all manner of infant sea life, as the trees are tolerant of—and indeed thrive in—salt and brackish water. I love trees; they’re calm, patient, strong, and attentive, eternally guarding and nurturing the ecosystems they support. In the deciduous forests of the North American mainland, it’s woodland critters that the trees protect; in the mangrove swamps, it’s sea life. Young sharks, baby turtles, many different species of fish, and innumerable snails, lizards, and—of course—birds. Truly, a sanctuary, and I feel so fortunate to have had the opportunity to visit such a beautiful place. Tranquil, too; without any large mammals (like deer) native to the islands, there are no predators or poisonous snakes. Most of the noise among the mangroves comes from birds and the soft lapping of waves. Oh, and noisy tourists that swarm off cruise ships. We paddled down a trail maintained, with permission, by a local company that also employed our guide. If the water was ever more than chest deep, I didn’t notice, and everywhere I looked, the softly waving turtle grass didn’t seem more than a couple feet away. That being said, I have no idea how far into the mud I’d sink once I stepped in. It looked like fine, loose silt, which would feel great between your toes, but could potentially sink you in far past your ankles. Amazingly, nobody got the chance to find out. Our guide was genuinely surprised that nobody fell in, and remarked that his day had been kind of boring because of it. Honestly, though, a lifeguard having a boring day is good news for the rest of us, so you wouldn’t have heard us complaining. In many places, the path was so narrow that the normal kayak paddles were too long to be of use, so the captain of the two-seat boat (the one in the back) was given a paddle that split into two. It came in handy; the interlocking mangrove roots leave very little extra room for blundering tourists in brightly colored boats. And blundering we were; the boat ahead of me, with my captain’s daughters in it, managed to get stuck perpendicular to the lane of travel with roots grabbing the bow and stern of their kayak. Quite frankly, it was impressive. Despite how it may sound, getting stuck was actually part of the fun. It was the only time I was able to get a really good look at the networks of roots and branches. Despite thriving in seawater, mangroves (like humans) have no use for that much salt but still need the water. They have several strategies for dealing with it: the two easiest to spot are the single yellow leaf that grows on each limb and the salt crystals that collect on the outside of the bark. Crystals that are only visible from a kayak when its nose is lodged in the edge of the complicated lattice the trees’ roots form. The yellow leaf is a sacrifice; the tree sends all of that branch’s salt into the one so that the others may flourish. Though my back had begun to ache and my arms were wondering how much further they’d have to paddle, I was sad when it was time to leave my kayak. There is a sweet tranquility to floating idly in an unpowered boat, one matched by the calm stillness of a forest in the daytime. Mangrove swamps are also interchangeably called forests; they possess characteristics of both biomes. I look forward to my next opportunity to float down a narrow corridor, tree limbs tugging at my boat, my paddle, my hair. A short ride through downtown Freeport and we were back aboard Carnival Pride. It was strange knowing that as I stepped onto the gangway that I was leaving the Bahamas to return to my home country. I’d never crossed an international border without going through customs or taking to the air, so simply getting on and off the ship (even with the little security checkpoint) seemed far too easy. I suppose that’s one of the trademarks of a cruise: international travel made easy—and luxurious. I anxiously await my next opportunity to spend time at sea, and I’m certain it won’t be too terribly long before I find myself in the Bahamas once again.